We all know about the surge in sales for luxury watches following the post-Brexit devaluation of sterling that sucked in high spending tourists from abroad. It is now over a year since that event, so we would expect it to be much tougher now to maintain high percentage growth rates compared to July-September 2016. Why, then, are we still seeing such sustained year-on-year increases? Gilly Netherwood, GfK’s senior client insight manager – watches, investigates. The question many involved in the watch industry in the UK have been asking is: how has summer 2017 compared against the remarkable summer 2016? We have now had the results for July, August and September and, while growth rates have slowed down, we are still seeing a bullish performance from the GB watch market. Overall, the market is up 10% in value in the last three months: July, August and September 2017 versus the same period in 2016. Growth is still being driven by the luxury brands with value growth for watches over £1,000 up 19% over the same time period. September 2017 has been a particularly strong month; in 2016 we saw September up 39.5% in value on September 2015, and this year September was up again, 28% on 2016. 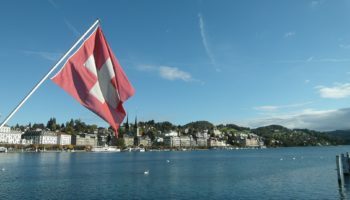 Although brands have increased prices through the year, which will account for some of the rise, overall average sale price has risen 23%, which is above most of these price rises. 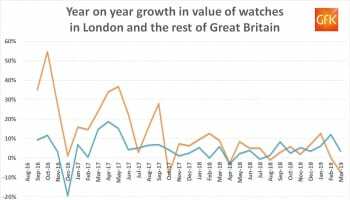 Tourism is still playing a role as London continued to take over 42% share of the watch market in value through the summer. The luxury market is still dominated by Gents watches, and above £1,000 Gents watches have continued to drive the overall market performance; July to September 2017 versus July to September 2016 value was up 38.6%. However, one trend which we have been following with interest is the shift in the Ladies watch market towards luxury watches. Once weighted towards watches under £1,000, growth in Ladies watches actually outperformed the growth in the Gents market over £1,000 in September. Ladies watches over £1,000 grew 31.8% in September 2017 versus September 2016, whereas the growth in Gents was a still respectable 21.9%. 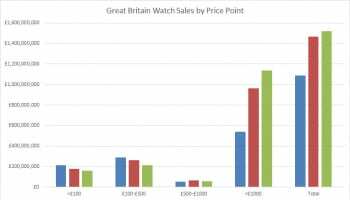 Sales of Ladies watches above £1,000 now accounts for a significantly bigger share of the Ladies market than watches below £1,000, which is the opposite to the market two years ago. 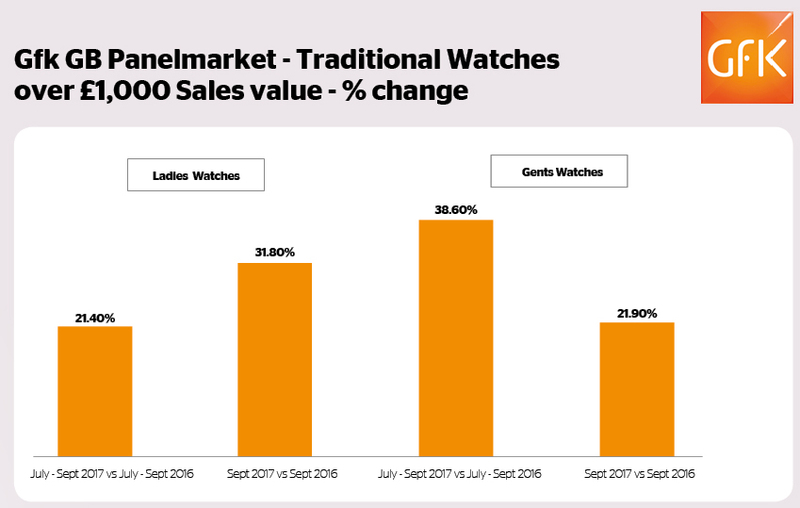 A rise in ASP has contributed to this growth in value (ASP for Ladies watches over £1,000 was up 30.5% in September 2017 versus September 2016) but it is also driven by an underlying increase in demand, volume sales of Ladies watches over £1,000 was up 28% in September 2017 versus September 2016. 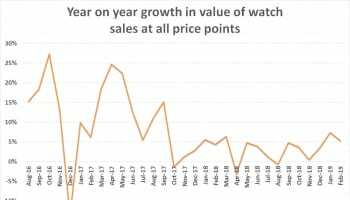 At lower price points the watch market remains soft for both Ladies and Gents with most price points under £500 seeing volume and value decline; the volume of watches selling for all watches under £500 fell 11.5% in July – September 2017 versus the same months in 2016. Although the rate of decline has slowed, it still represents a worrying trend for the long term health of many brands that rely on this sector. As we approach the Christmas gifting period, when share of sales from luxury watches falls, the challenge faced by the market under £500 will be more exposed and could start to drive the top line market value down. Declining volume sales is nothing new for the watch market, our increasing reliance on mobile phones to tell the time has been a factor in fewer traditional watches being sold every year for the past eight years. At the current rate of decline we could see the traditional watch market reach lows of around 5 million units by 2020 (down from 7 million in 2016); with well over 300 brands selling at any one time in the GB market, it is likely that many will find this challenging. 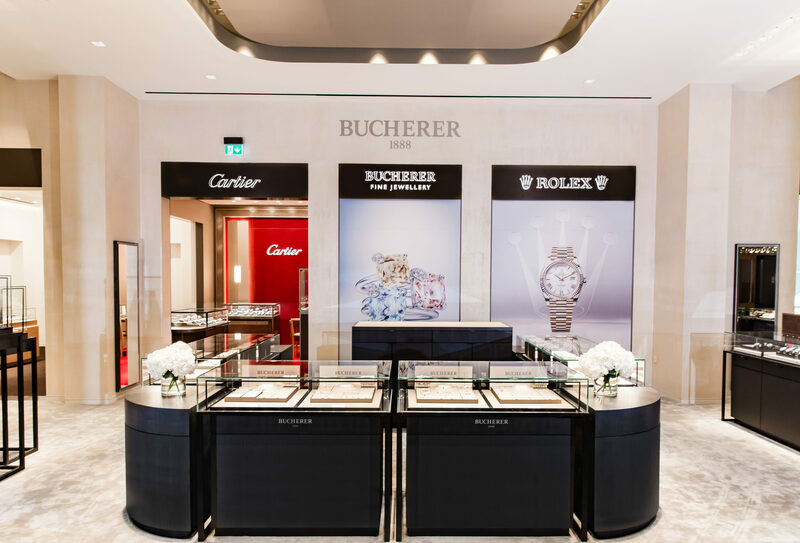 Inevitably digitisation will continue to disrupt the traditional watch, whether it is in product innovation, marketing communications or retailing. Despite the watch market seeing value increase every year for eight years, 60% of brands we track saw their sales value from traditional watches decline in the last 12 months. Brands are under constant pressure to maintain relevance in an increasingly crowded and complex market. Knowing when, where and how to deliver compelling experiences that create added value for both consumers and brands is critical. It is becoming evident from looking at the 40% of brands that are growing in value, that many are pulling ahead of the pack in their ability to develop emotional connections and relationships with consumers and decision makers; to do this they consistently seek to understand what motivates consumers, how they use technology, what influences them, and importantly how they relate to their brand in a digital world. It sounds simple, but it’s not easy to think like your consumer, as every marketing, brand, and communications manager will testify.